PORT-AU-PRINCE, Haiti – Elizabeth was exhausted after hours of contractions at the Petite Place Cazeau clinic, in Port-au-Prince, Haiti. Finally, with gentle guidance from the midwife, she gave one last push. Stifled cries filled the delivery room. The nurse presented a baby girl to the new mother. Through half-closed eyes, Elizabeth watched as her daughter was cleaned and weighed. Afterward, in a spacious recovery room, she cradled her baby – whom she had named Lisa. “It was a bit difficult, but I felt safe,” she told UNFPA, explaining that she had not expected such sophisticated care. The facility is one of four so-called ‘smile clinics’ in Haiti. These UNFPA-supported centres offer a full range of services, including antenatal care, family planning counselling, and basic emergency obstetric and newborn care – all free of charge. The clinics also offer hands-on training to new midwives. The director of the Petite Place Cazeau clinic, Dr. Harold Scutt, insists that midwives take the reins on all obstetric and newborn care. It is recognition of the critical role midwives can – and must – play in saving women’s lives. “Midwifery training contributes directly to reducing maternal mortality,” he said. “For example, they learn to detect the first signs of eclampsia, which is key since pre-eclampsia and eclampsia remain the leading causes of maternal death during childbirth." These services are essential in Haiti, which has the highest maternal death rate in the Western hemisphere. 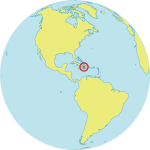 Haitian women have a 1 in 90 chance of dying from pregnancy-related causes in their lifetimes, according to the 2015 Trends in Maternal Mortality report. By contrast, a woman in Canada has a 1 in 8,800 chance of dying from such causes. The country’s vulnerability to natural disasters has not helped matters. Catastrophes like last year’s Hurricane Matthew reduce women’s access to health facilities. 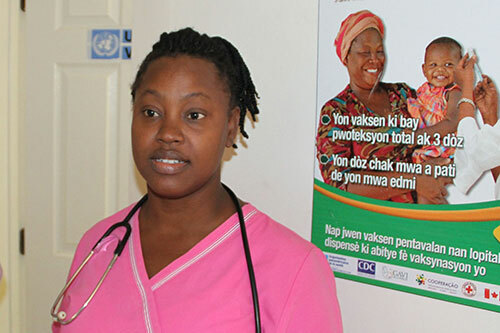 UNFPA is working with the government to increase the supply of well-trained midwives. In downtown Port-au-Prince, near Cité Soleil, the Isaiah Jeanty Hospital is temporarily hosting the National Midwifery School in earthquake-resistant containers. The school’s original building was severely damaged by the 2010 earthquake. It reopened in 2013 with support from UNFPA and the health ministry. UNFPA also provides assistance with transportation, equipment and the curriculum. “Did you know that in 2013, we only had 211 midwives throughout the country?” asked Quettly Chevalier, the institute’s director. 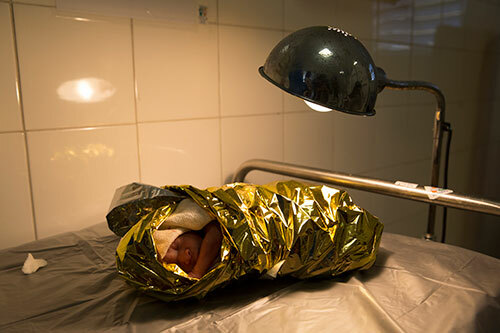 The World Health Organization has estimated at least 2,200 midwives are needed to significantly lower maternal deaths. The school is steadily closing this gap. 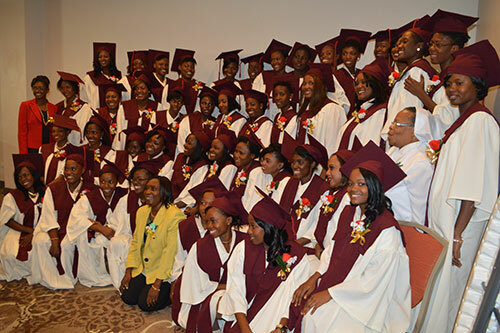 From 2000 to 2017, it trained 349 midwives, and more than 80 midwifery students are currently enrolled in the programme. Friday, 5 May, is the International Day of the Midwife, a day to celebrate the work of midwives around the world and to highlight the need for more health workers trained in these life-saving skills. Midwifery-led care is considered to be highly cost-effective. With the right training and support, midwives could avert roughly two thirds of all maternal and newborn deaths, experts estimate. They also learn to provide sensitive and dignified care that improves women’s trust in the health system. That was true for Gertrude Duval, who was resting in the bed next to Elizabeth. Ms. Duval had just given birth to her second child. "It is so different from the hospital in which I had my first child,” she said. Her improved experience was thanks to professionals like midwife Résia Pierre Pierre. “When helping a woman giving birth, every move must be precise, fast and accurate. We are responsible for two lives,” Ms. Pierre explained. Still, she encourages others to join her, and counsels them to follow the example set by countless midwives around the world and “do their work with love."